My husband recently taught Roo how to play checkers, which has been a lot of fun for both of them. 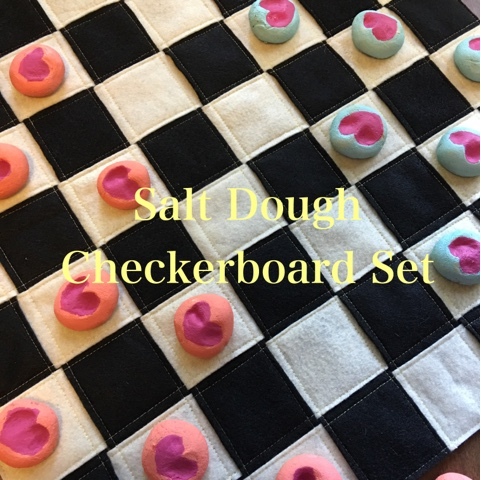 Because it's Father's Day, and we only have a glass checkers set, I thought we could make a fun, personalized set that would be easy to take camping or to the beach. We made this in one afternoon/evening and you can too. It would be a great gift for grandpas, uncles, dads, pretty much anyone who likes to play games. It's a perfect, inexpensive gift for your child's friends! I didn't intend to post a tutorial, so there's not a lot of pictures but I think you'll get the idea anyway. Have fun! Mix all ingredients in a medium bowl, starting off with 1/2 cup water and adding more as necessary. The dough shouldn't be sticky, but should pull away from the sides like bread dough. Knead dough on a lightly floured surface until smooth. To make checker pieces, roll a small ball (about the size of a walnut or 1" in diameter). Press pinky fingers into ball to flatten, creating a heart shape. 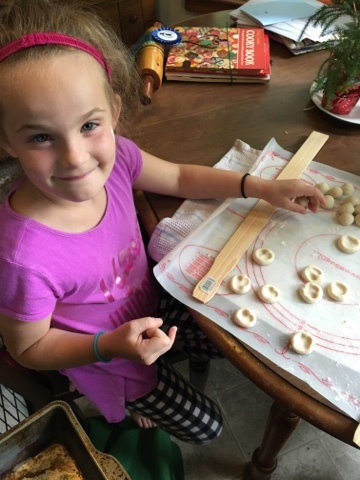 Some of these started looking like pig noses, so we re-rolled them and tried again. 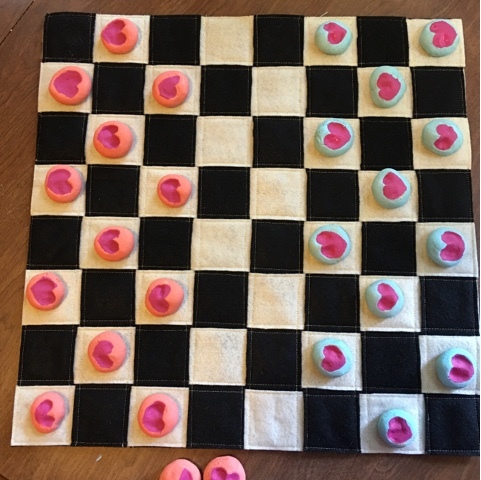 There are 24 checkers pieces total per game, but we made 28 just in case. Bake in a preheated oven at 175° for about three hours. While the pieces are baking, cut both colors of felt into eight 2"x18" strips. 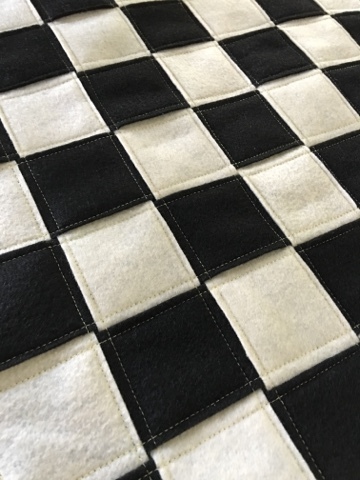 Chain piece across the short ends of the white felt strips to connect them all together. Try to connect the strips with no gaps between. Turn the piece around and connect the opposite ends, making sure all strips are flat and not twisted. Edge stitch down the length of each strip on both sides, in both directions. Stitch all four sides, then trim away the excess. Now, using a sponge brush, paint half of the checker pieces one color, the other half in the second color. You will want to add about a teaspoon of Mod Podge per three tablespoons of paint before painting. 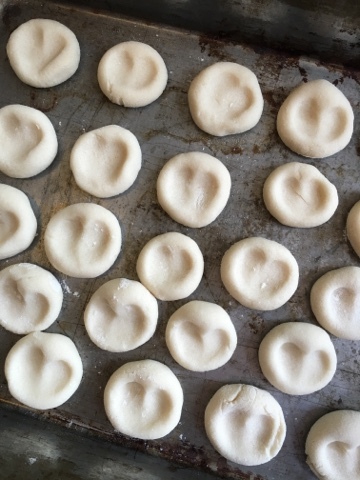 This will seal the salt dough, making it last longer. When they are dry, you can go back and fill in the heart with the watercolor brush. That's pretty much it! 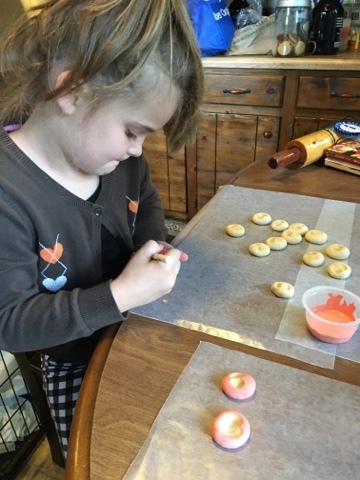 This is a pretty great rainy day activity, and is something the whole family can make together. PS I haven't done this yet, but I'm going to buy a can of sealer and spray the checker pieces (top and bottom). I've heard that if you dont, they can and will crumble up and be ruined over time.